Crispy, crunchy vegetable pancakes are summertime fried into pure comfort food. The fresh sweetness of the shredded vegetables is complemented by the electric zing of a creamy lemon-garlic sauce. Together, the latkes and white bean sauce make a complete and satisfying light meal or snack. This recipe has been several years in the making. The first batch of vegan latkes I attempted were an unmitigated disaster. Weighed down by too much matzoh meal, they were too chewy, not very crispy, and a most unappealing shade of grey to boot. After slaving away on the recipe, shredding the potatoes by hand on a grater–these were my pre-food-processor days–it was a major disappointment. I swore I would never attempt another latke again, and we resigned ourselves to clearly inferior packaged latke mixes around Hannukah. It was with pure desperation that I decided to reattempt a latke recipe this summer. The beets and zucchinis were flooding our farm share bags week after week, and I needed a new strategy. This time, I was determined to develop a latke that would uphold the light, crisp virtues of its non-vegan predecessors, and show off the bright flavors and crunchy textures of the small, tender summer squash, bright beets, and sweet new potatoes crowding my pantry. When I was first testing this recipe, I was a bit reluctant to call them latkes. My husband is not alone, I’m sure, in maintaining very specific expectations of his childhood comfort foods. Since I was straying from the traditional potato-egg formula, I wasn’t sure how these would be received as latkes. After he polished them off his dinner plate, I tentatively posed the question to him: So, would you call these pancakes “latkes”? Josh: Why would you call them anything else? Me: Well, you know, these aren’t exactly like traditional latkes. Josh: These are latkes! What else would they be?! And that was that. So there you have it, straight from my resident latke-loving expert. These are latkes. Even after removing the egg and playing with the vegetable choice, they still retain their inimitable latke-ness. And that is a wonderful thing. Note: I packed the shredded vegetables down into the measuring cups. 1. If making the zucchini version, shred the zucchini first, and place it in a strainer set over a bowl. Add a pinch of salt, and toss the zucchini shreds to combine. Set aside for 15 minutes. Then, squeeze handfuls of zucchini shreds in your hands, over the strainer, to remove any excess water, and blot with a towel. 2. 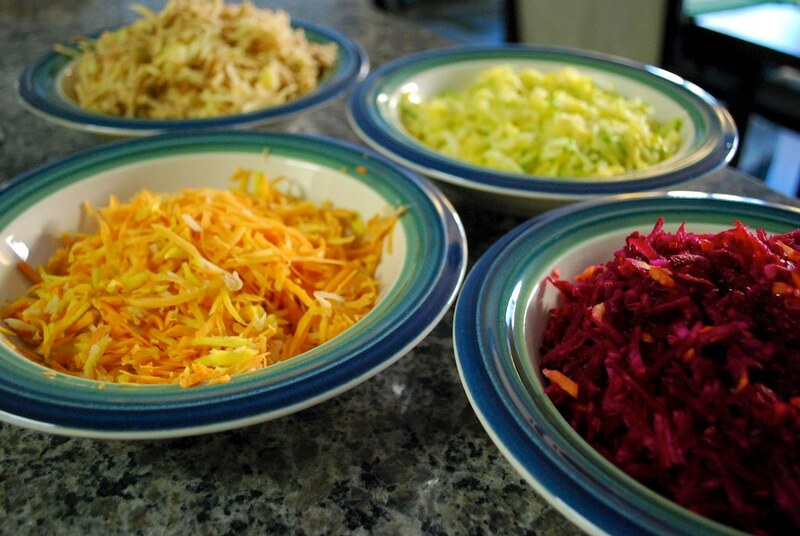 Mix together potatoes, carrots, zucchini or beets, and onions in a large bowl. 3. Stir in the flour, cornstarch, salt, and pepper, until well combined. 5. Heat a large, heavy frying pan over medium heat. Spray the bottom of the pan with cooking oil, or add 1 tbsp of canola oil. 6. Take a small handful of the vegetable mixture into your hand. Clump it into a ball, and then press it between your palms into a thick patty. Don’t worry if your latkes seem fragile at this point, they cook up into a sturdy treat as they fry. 7. Put the latke on the frying pan, and then press it thinner using the back of a metal spatula. Cook latkes in batches to avoid crowding the pan. Allow to fry for a 4-6 minutes on each side, until golden. Press them with a spatula again after flipping. Serve piping hot, topped with Lemon & Garlic White Bean Spread. NOTE: Small, tender summer squashes tend to have less water in them, and are particularly well suited to this recipe. If you have a large, watery squash, be certain to follow the instructions in step #1 carefully to remove excess liquid. This ensures your final latke retains its crisp texture! 1. In a small frying pan, heat the olive oil over medium-low heat. Add garlic and fry for 2 minutes, until it starts to turn very lightly golden. 2. In a food processor, combine beans, lemon juice, ketchup, water, salt and pepper. Spoon the oil and garlic into the processor. Whir until smooth. NOTE: You will have to trust me on the addition of ketchup. It adds a lovely sweetness to balance the lemon flavor, and it doesn’t overpower the spread one bit. 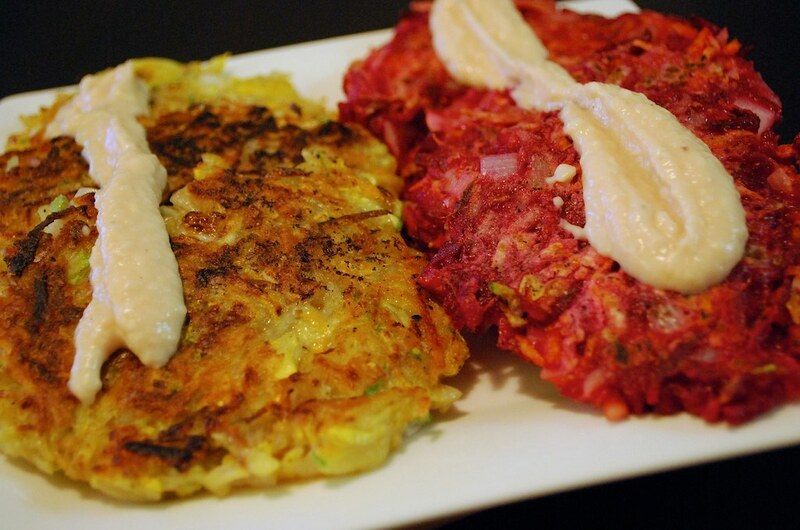 This entry was posted in appetizer, side dish and tagged beet, carrot, latke, potato, potato pancake, recipe, summer squash, vegan, zucchini. Bookmark the permalink. These look great. I would call them latkes too. SO delicious looking. I have not had breakfast either….stomach growling! Ah, this looks so tasty. They are kind of like the veggie pancakes I recently made from Mark Bittman’s Food Matters book. Very tasty and a great way to help non veg fans eat more veggies. I like your sauce idea. Woohoo for vegan latke success! 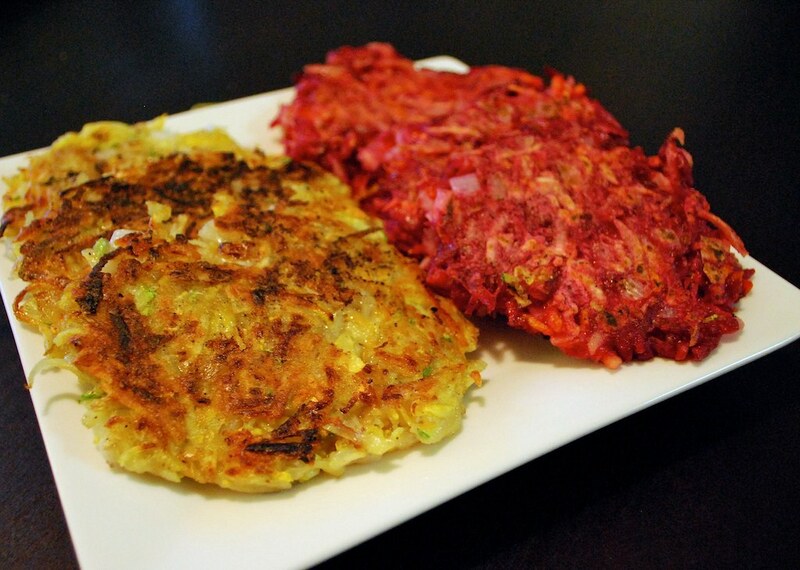 I’ve seen beet pancakes referred to as rösti or roesti although that’s simply the Swiss word for potato pancake. I might try frying up a pancake with beet stems! “ [In Sweden,] when prepared with a batter of wheat flour, milk, egg, and shredded potatoes and fried like thin pancakes, they are called raggmunk, which literally translates as “hairy doughnuts” (the grated potatoes make them look hairy).” I think I’ll call them hairy doughnuts from now on–haha! Thanks Erika! You should give it a try. If you have a food processor with shredding blade, it’s really not very much work. And you could always skip the bean spread and substitute the traditional latke accompaniments–(vegan) sour cream or applesauce–to save time. My mom just gave me a zucchini from her garden that is literally larger than my cat, and I think this is the perfect recipe for it. Growing up, we always made some zucchini and carrot flavored latkes in addition to the plain potato ones, so I can’t wait to make my first vegan latkes! Hope you like(d) them Shandra! I was so happy to finally have a vegan latke recipe that works. I’ll have to figure out how to tweak it for Passover without ending up in the dense overloaded-with-matzoh-meal territory. Maybe potato starch will be sufficient to bind it? Or maybe just a tiny bit of matzoh meal? We’ll see! How did you prep the beets? Did you peel and shred them raw? The beets are raw. I just peeled them, and then shredded them in my food processor. (Box grater would probably also work, but would require more elbow grease.) I hope you enjoy them!